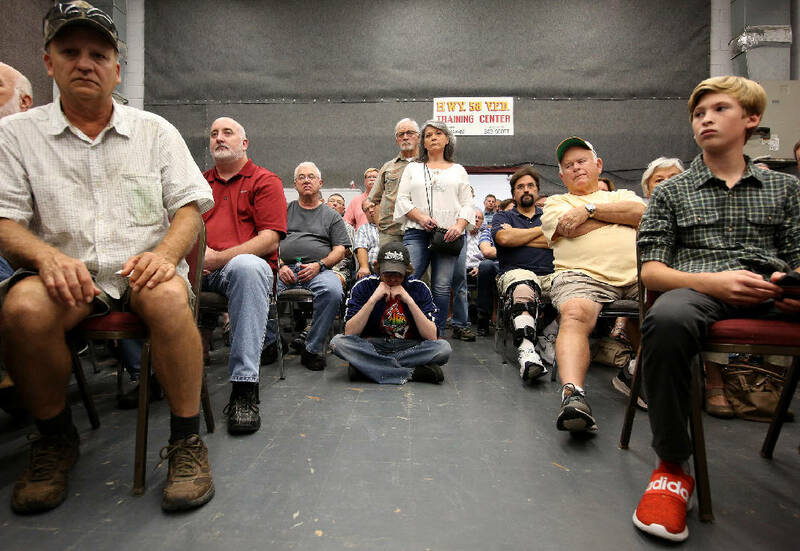 The Fire Department Training Center in Ooltewah, Tennessee, is completely full of residents who do not want a sewer plant built in their community during a Water and Wastewater Treatment Authority public meeting held Thursday, October 11, 2018. The room was filled from wall to wall with chairs, and individuals were peeking in from all doors to listen to what was happening during the meeting. Furious homeowners in the North Ooltewah area don't dispute the need for the plant but want it placed somewhere other than their communities. Many spoke heatedly at public meetings about their fears of health impacts, wetlands contamination, sewer stink and loss of value in their most important investments, their homes. Thursday's meeting needed to be different, Smith said. "We can use that time to complain about how we don't want it, but we've done that. Let's use the time to talk about how we can move forward, maybe get some suggestions about what can be done," he said. "How many of you remember how you felt at that first meeting?" he asked. "I remember how I felt when I saw the yellow sign. That's the energy you need to draw from every day in this situation. Keep that energy and keep that pressure on. They go home from work every day. We don't. It's 24/7 for us." "WWTA is not moving. This is their site. They're not backing down," Morehouse said. Every person in the crowd got contact information for elected officials all the way up to Tennessee's senators, as well as the state environmental agency and the WWTA board. Meanwhile, the committees will be coming up with an "accurate, referenced, hard to refute" presentation for the planning agency and, on Dec. 19, the Hamilton County Commission. "When we do speak to WWTA and the county commission, we have nine minutes," Morehouse said. "We've got to make the best use of that nine mines. We have to have the best case as to why this needs to be moved somewhere else." But they enraged the property owners at Tuesday's public meeting when they said they had not done any sort of community impact study or calculated the potential loss in property values for the homeowners. "What we're trying to do is make WWTA look foolish, because in my opinion they are," Morehouse said. "When you go to the Regional Planning Agency, everything is done in the back. It's a dog and pony show. The only way to stop this is to go to your wallet and find the best attorney money can buy," he said. "Everyone here is going to have to ante up, otherwise this plant's going to happen."